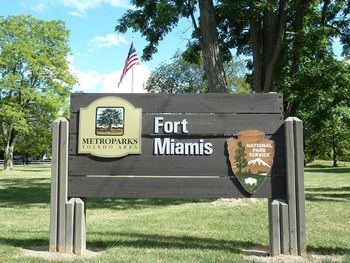 Fort Miamis (1760-1817) - First established by the British in 1760. Occupied by American forces 1796-1797. Again occupied by the British in 1812 and abandoned by them in 1817. First established in 1760 by British troops who occupied an abandoned French trading post. The British rebuilt the fort in 1763 and again in 1785. Under the British the fort was built as a log stockade with four bastions capable of mounting four cannons each. The land side of the fort was protected by a ditch 20-25 feet deep making the fort difficult to attack. The Jay Treaty, signed in November 1794, clarified many outstanding issues from the Revolutionary War including ownership of Fort Miamis. The treaty took effect in 1796 and the fort was turned over to American forces that year. The fort continued to be occupied by American forces into 1797. Fort Miamis was reoccupied by the British in 1812 during the War of 1812 and abandoned by them after the war in 1817. Part of Fort Miamis National Historic Site. Markers and earthworks, no period cannons or mounts. 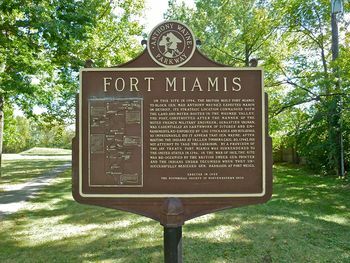 Location: Fort Miamis National Historic Site, Lucas County, Ohio. This page was last modified 08:27, 26 March 2019 by John Stanton.